My studio isn’t that big. It’s perfect for what I’m up to most of the time, but I still have to fold things up and put them away sometimes. 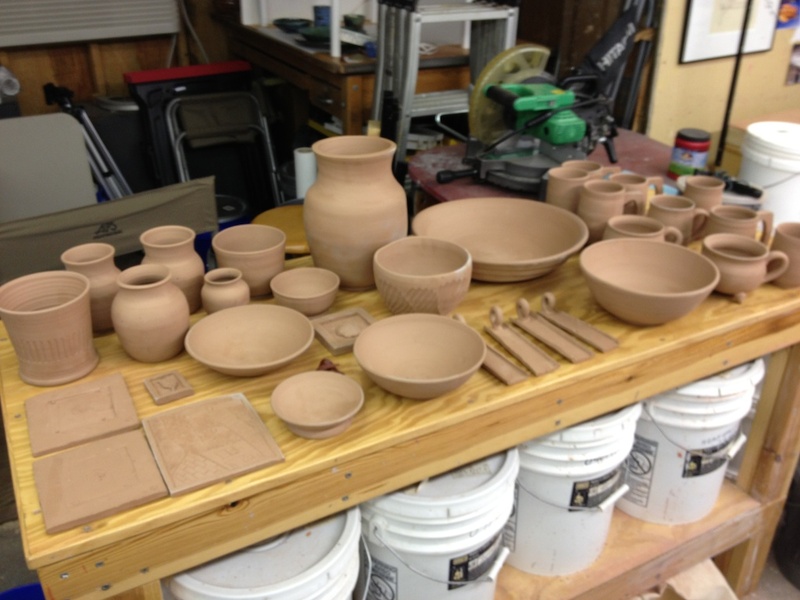 Today, I had all the folding tables unfolded, and set up to sort out the bisque ware in preparation for glazing. Glazing, for me, is generally not my favorite part of the process. I’m still pretty fascinated with throwing. I do have fun glazing, but it’s secondary. Usually. This time around, I decided to think about it more than usual, and be a bit more organized in the execution of the task. I made note cards. I lined stuff up behind the cards. I planned the glaze order based on based coats and complementary accent dips. And it’s all sitting there, waiting to be, well, glazed. Tomorrow. Normally, I just look at what’s on rack, having been recently been waxed upon the base. I think, “hey, that would be nice in blue” and continue in such a manner until everything is coated and waiting to be loaded into the kiln. There’s usually a bit of remorse, or at least the odd thought along the lines of “oh, that was supposed to be green.” Well, tomorrow, there won’t be any of that. At least that’s the theory. I’ve seen some combinations of glazes that caught my interest. Usually, I’ll try those on smaller pieces. 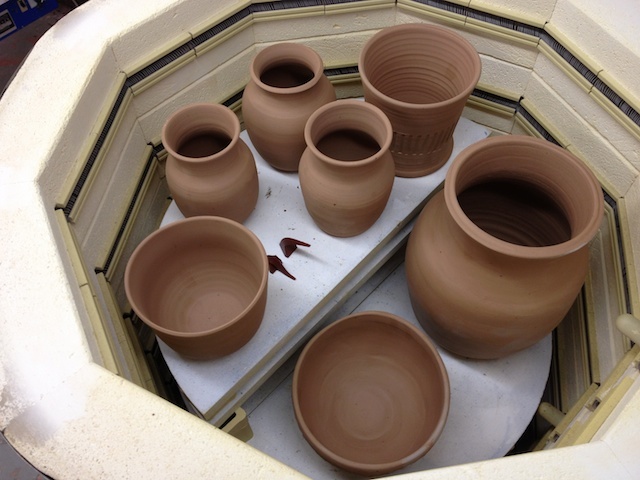 I also make glaze test pieces, but once the basic test has been done, it needs to be applied to a real piece of ware. I have a couple of those lined up for this next cycle. I’m also testing some slip decoration techniques, and some decorated tiles. And then there’s the big bowl – my personal best so far. I forget the full dimensions but until the glaze firing is complete it won’t really matter. So, we’ll see what turns out. Between the bowl eating a whole shelf and the tiles, it’s going to be a light load. At 7:45pm, I started the slow glaze firing program. It should finish in the wee hours, and by Friday, we’ll see what happened. There are some new glazes and combinations in this load, so I’m kind of on pins and needles.